The story of the Taco Mac chain - great beer, food and atmosphere. Atlanta's sprawling chain of Taco Mac pub/restaurants began life in 1979 in a pint-size location tucked away in a corner of the quaint Atlanta neighborhood known as Virginia-Highlands. Two friends from Buffalo, New York decided to buy a closed taco shop here and sell wings and a variety of domestic and import beers. Because of very limited funds, the guys opted to purchase new kitchen equipment and keep the old sign and name. 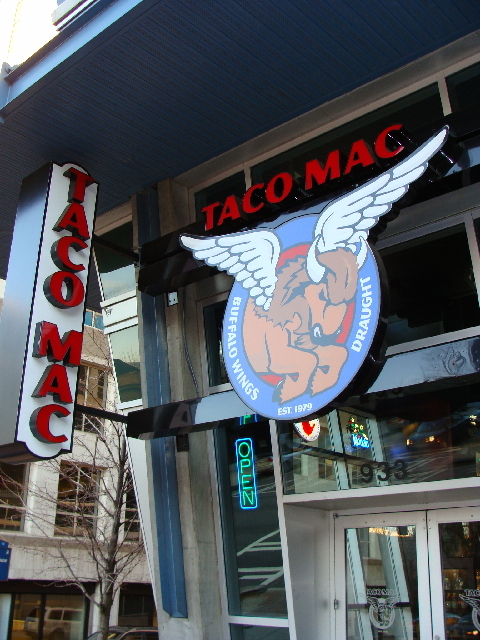 Following these unassuming beginnings, Taco Mac was acquired by the Tappan Street Restaurant Group and blossomed into almost 30 highly successful locations in Georgia, Chattanooga and Charlotte, NC (coming soon). Modern Taco Macs offer an ever-expanding selection of domestic, craft and import beers, an extensive menu of tasty pub fare, a multitude of TVs, and a casual, fun, welcoming atmosphere. Fred Crudder, Taco Mac's Beverage Director, quickly points out that Georgia's new love affair with craft beer drives much of the phenomenal interest and booming business in Taco Mac. 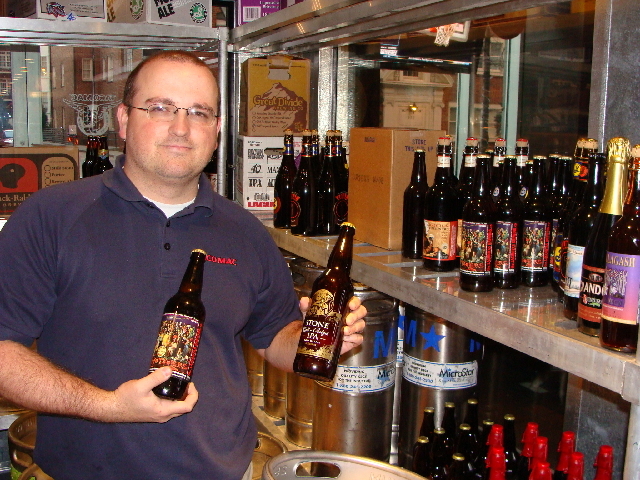 "The quality and variety of beer that we're able to offer these days is vast," says Crudder. "Ten years ago most of our locations had 90+ beers on tap, but changes in Georgia's laws to allow high gravity beers and amazing new interest in craft beers and world beer styles has opened up the floodgate of breweries interested in selling beer in Georgia. The beer selections at Taco Mac are extremely diverse, and our customer and staff beer education efforts are a priority." Ben Miller, Managing Partner at Taco Mac Kennesaw, gives credit to Fred Crudder for much of the momentum of Taco Mac's big craft beer program. 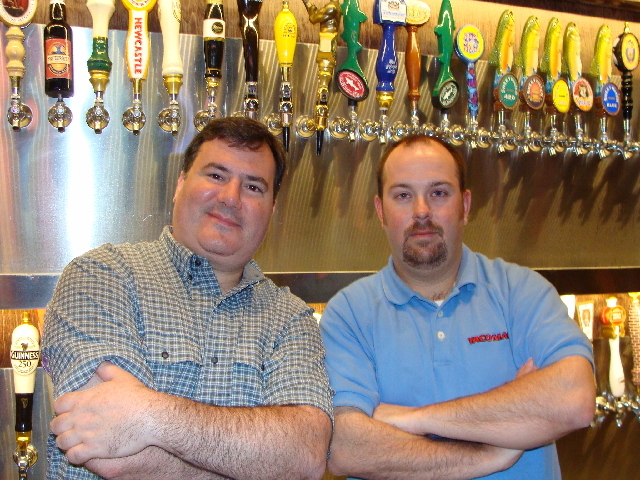 "Since Taco Mac brought Fred on to be our ambassador to the beer world, I feel our credibility in this community has been strengthened, and great things have been happening. His relationships with breweries, brewers, writers, respected people in the community, as well as distributors and consumers have brought a tremendous amount of attention to us. Fred has also made changes in the company (like our Beer of the Month program) that have grown our understanding of beer as well as training of employees." Crudder's love affair with beer began at age 19 in the late 80s when he held a job at a Michigan beer distributor loading trucks at night. This particular distributor offered Schlitz, Coors, imports from Merchant Du Vin, Aass Biers, and a range of Belgian ales and various imports. Crudder appreciated the more flavorful beers from the start and never left the beer business. "I then worked in a great package store in Kalamazoo, Michigan for awhile, then at age 23 transitioned to the Corner Bar - the beer best bar in Kalamazoo. After that, Bells Brewery hired me as bar manager in their taproom, then I came to Georgia as store manager at Taco Mac's Old Milton Parkway location. I immediately saw opportunity for Taco Mac to expand its craft beer program." Crudder adds, "I would compare Taco Mac's current clientele to a ravenous mob on the lookout for new beers - it's a wildfire that's under control but shows no signs of abating. Our beer-loving patrons show no limit for their ability to be challenged by new beers and accept them with open arms. We also try to teach new beer drinkers about the world of craft beer - that there's much more to beer than standard American lagers." Taco Mac's policy focuses on a system of constantly rotating draft selections, and customers seem to enjoy the opportunity to enjoy new ales and lagers on a regular basis. At times, a dozen or more new draft beers wait to be hooked up at Taco Mac locations as soon as another brand runs dry. Fred Crudder admits, "This sometimes make ordering and distribution a challenge, but it's worth it. Our extensive, rotating taps also allow us to offer customers small samples of just about every major style of beer in the world. Customers learn a great deal about beer at Taco Mac." Taco Mac makes every effort to be on the cutting edge of craft brew trends. Locations in Buford, Canton, Metropolis (downtown Atlanta) and Decatur recently shelled out the bucks to install English-style beer engines with cask breather systems. Cask-conditioned ales routinely flow from Lagunitas, Victory, Rogue, Left Hand, North Coast and local microbreweries such as Sweetwater, Atlanta Brewing and Terrapin. It helps that people who run the Taco Macs - everyone from the waitstaff and managers to corporate executives - are also enthusiastic Taco Mac customers. 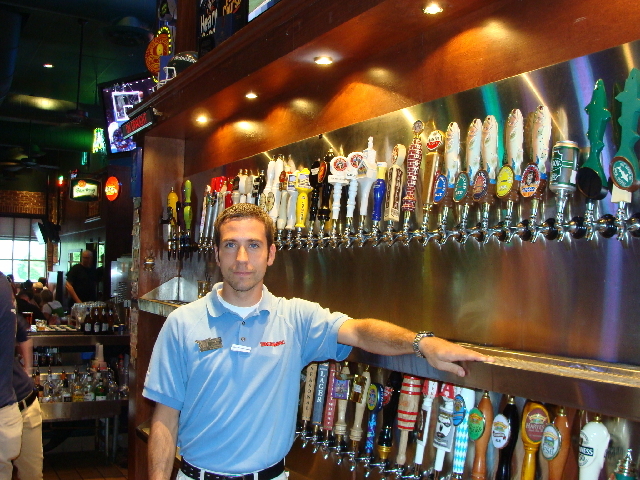 "I love great beer and football, and spend a huge amount of my off time at Taco Mac enjoying both," claims Fred Crudder. "Taco Mac owners and employees love our places, and we hope it shows. The staff and atmosphere at each location offer something special." Buford's red-hot Mall of Georgia Taco Mac employs Jason Everett - a General Manager also known as an accomplished all-grain homebrewer and bona fide beer fanatic. Everett explains, "It can be difficult to get people from Buford to try a different beer when they've bought the same one for the past 30 years. When a customer orders a standard, domestic lager, we give them a sample of the beer alongside a taste of a craft lager or lighter ale. This gives them a chance to see what they've been missing." Central Atlanta's Taco Mac Metropolis features multiple attractions. 140 draft lines make beer premiers and special tastings very practical. With rare bottles and kegs being stockpiled on a regular basis, Metropolis' beer cellaring program forms a main focus of the pub that employs a glass front corner of the beer cooler displaying an impressive selection of vintage beers - a major temptation for big-time beer geeks. Many people (usually other bar owners) often ask for tours of the beer cooler. "The idea of aging great beers struck me over a 2005 Stone Russian Imperial Stout at the Falling Rock Taphouse in Denver during a visit to the GABF," mentions Fred Crudder. "I came home, proposed the idea to Taco Mac, and was immediately given the green light to make it happen at Metropolis." Bob Rhein, Managing Partner in Decatur, explains, "Taco gives its managers the chance to dive into the deep end and expand the limits of our beer knowledge and our own taste buds. It's a hard job to drink beer not just for fun, but for the sake of our customers." Taco Mac Decatur, a laid-back neighborhood bar in a dynamic and pedestrian-friendly suburb of Atlanta, boasts a very diverse, interesting range of regular customers. "The best part of the job is talking beer with customers and helping someone down the beer path," adds Rhein. "We offer a Passport Club with a reward system for tracking which Taco Mac beers members try, and last week a guest came in with 1079 beers on his passport. It was a challenge, but we still had six new beers for him. He was amazed." When asked how Taco Mac has embraced the craft beer surge in the past couple of years, John Hill, Assistant Manager of Metropolis, replies, "It may be more accurate to say that Taco Mac helped spark the craft beer surge (at least in the Atlanta area). A lot of other bars see our success and realize that craft beers will sell. It's awesome to be able go into so many bars and see Dogfish Head and Victory on tap, and I think Taco Mac has a lot to do with that." Constantly impressed by the caliber of beer loving Taco Mac customers, Hill adds, "Thanks to beer websites and blogs, our excited customers know what's coming as soon as we do - sometimes earlier. For some, beer has transcended hobby and become a culture. When new breweries hit our market, many customers have already researched them extensively." Due to the abundance of locations, customers often embrace their nearest Taco Mac. Assistant Manager Josh Staley adds, "My location here in Peachtree City, which is in the suburbs of Atlanta, gives our guests the ability to enjoy craft beer basically in their backyards, just around the corner from their homes without traveling to Atlanta." Peachtree City also houses the largest patio seating area of any Taco Mac location. The Taco Mac in Suwanee, Georgia pours a smaller beer range than most, but General Manager Rob McIntyre still agrees that craft beer enthusiasts make up the heart of his pub. "My Suwanee Mac has a great group of loyal beer fans. Having only 50 taps makes our draft wall one of the smaller ones in the Taco Mac family, but with the help of our die-hard customers, we easily rotate our selection, making every week a different beer experience. I don't readily admit this, but some of our guests know more about the beer than I do." Taco Mac Kennesaw's Ben Miller provides a personal account illustrating how employees often make their way to the chain. "I started as a server with Taco Mac Chattanooga in 1999, about a moth after the location opened. I had dinner there one night with my friends and applied for a job two days later. Great atmosphere; very laid back style; great wings, burgers and southwestern food items for the price; and the beer selection was like nothing I'd ever seen before. I was impressed. I was 21 and didn't know beer could have so much flavor - I was hooked very quickly. Ten years later, I'm a Managing Partner of an extremely successful location and feel very excited about the future of our company." As Taco Mac continues its craft beer evolution and endeavors to satisfy demand, Fred Crudder compares the Southeast and Atlanta beer cultures to a craft beer sponge. "Like many in this business, I wonder where the craft beer saturation point is, but I don’t think we are close yet. There's still lots of room yet for expansion, and Taco Mac is excited to be a major part of it."